2014 has been such a special year for me, being my 30th anniversary as a solo artist, and i really do have you all to thank for making it an absolute cracker! I’ve had fair few people ask me about footage from this years 30:30 Hindsight tour, and it’s with great pleasure i’m announcing the pre-order of an extra special 30th Anniversary Rockumentary DVD, which will include footage from the 30:30 show in my hometown of Adelaide. 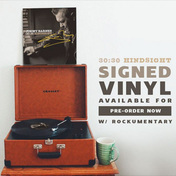 The DVD will also feature behind the scenes footage, and a mini documentary on the making of 30:30 Hindsight! The team and i have put together a few pre-order packs, available exclusively on theSFR store, which include the DVD, a signed limited edition vinyl of 30:30 Hindsight (not available anywhere else), a coffee table book with loads of rare pictures from my career, and a few more goodies. Everyone who pre-orders before December 17th 2014, will get exclusive access to a LIVE STREAM of my 30:30 Hindsight show in Adelaide on December 19th, and the first 500 people to pre-order will have their names listed in the credits of the 30th Anniversary Rockumentary! CLICK HERE to visit the store & check out the pre-order packs! Not all packs are signed!